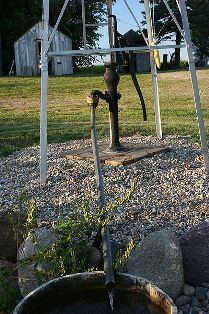 Advantages of using windmill pump? It powers itself from green energy. According to many estimates, it can recover its cost in 5 years. It can be used anywhere, even in areas where electricity has not reached yet. If used with drip irrigation, it works automatically without human intervention. How wind mill pump works? Windmill revolves with the force of wind and that revolving energy is used to pump the water out from the tank. Windmill rotates crankshaft which push and pull the rod attached in up and down motion. This rod contains in a long pipe with one way valve at the bottom. When windmill pulls the rod, water from the tank get sucked into the pipe, but when it pushes the rod down, one way valve doesn’t allow the water stored in the pipe to return. This way, with the help of continuous up and down motion, pipe starts to fill up and eventually reaches to the height and water comes out.